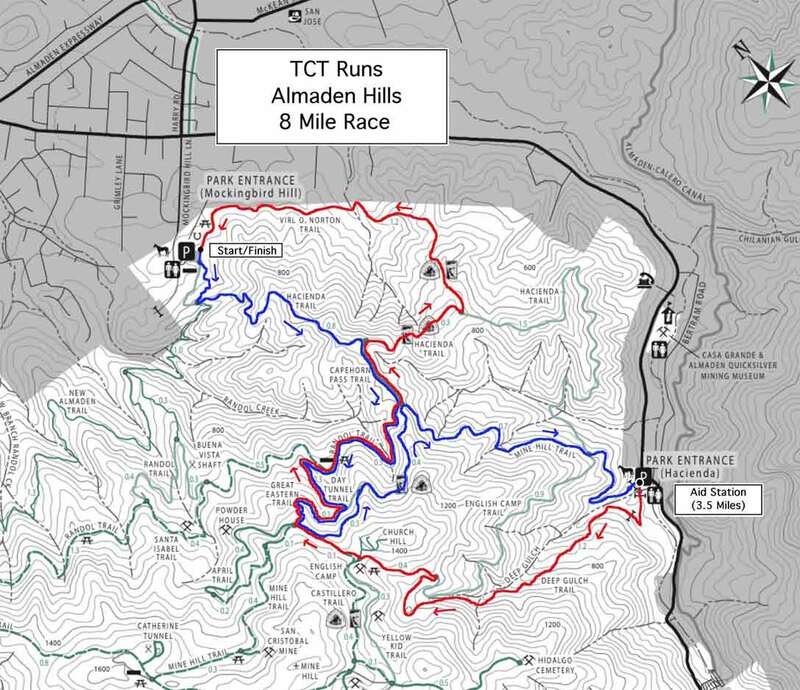 This event is set in Almaden Quicksilver park, in the beautiful hills of Almaden Valley. It’s comprised of 60% dirt roads, 40% single track, and is very hilly, with great views, awesome countryside. In a nutshell: It’s challenging and very fun. Active military receive a 15% discount. Entry fees are non-refundable unless the event is cancelled. Pre-registered runners may purchase a T-shirt for an additional $20.00 two weeks before the race. 7:45 AM: Trail briefing at the start/finish. First run the 13 mile course and return to the start/finish. 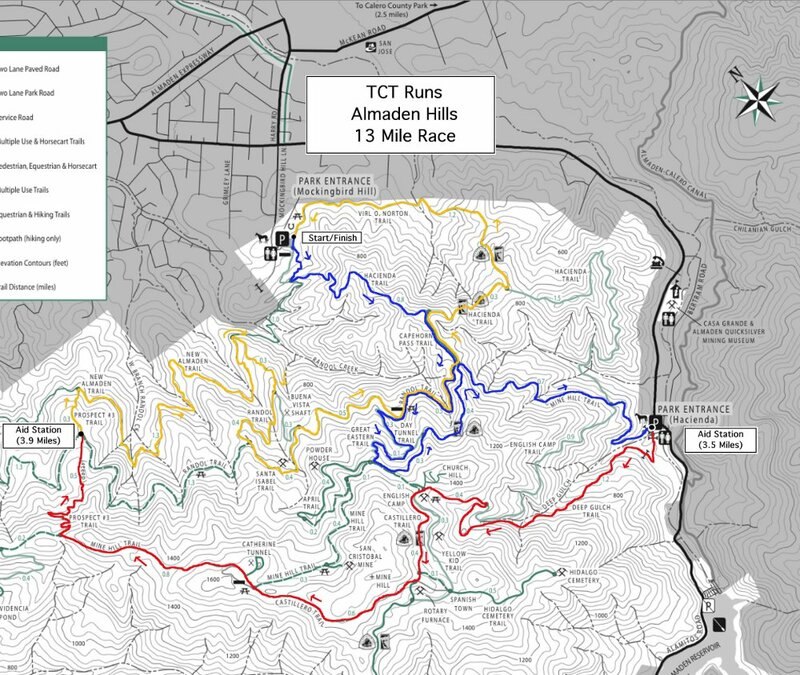 13 mile course will be marked 13 and designated Ribbon color. Then reverse the course. 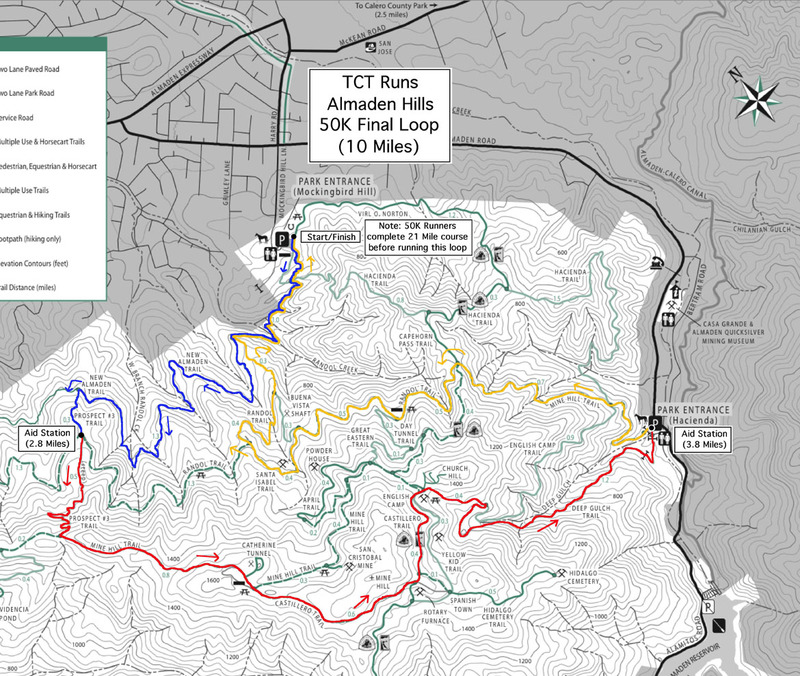 This section will be marked 26 and following designated Ribbon color. Runners then return to the start/finish for race completion. Runners go back out for 4.5 miles, following 50K and designated Ribbon color return to start/finish. You are done. Course will be marked with the following info below. Gypsum direction arrows and distances. Signs with distances, direction arrows. 50K: PINK RIBBONS First for the 26 mile course then for the last 4.5 miles run ORANGE RIBBONS. 11:30 am Start/Finish/Mile 13: Mockingbird parking lot Aid Station/Runner OUT of Aid Station. 3:00 pm Start/Finish/Mile 26.2: Mockingbird parking lot Aid Station/Runner Out of Aid Station. 5:00 pm: Race is Over. There are four fully stocked aid stations. 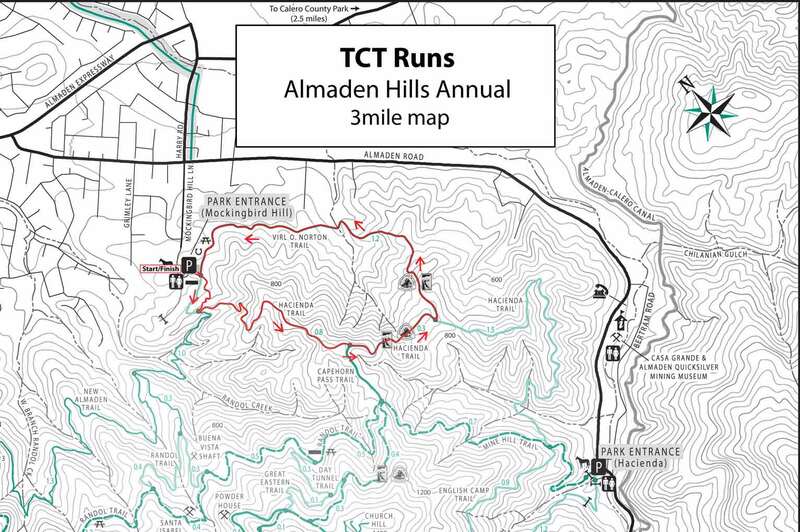 Bathrooms are located at the start/finish, Hacienda Aid station at 8.9 miles and up and McAbee entrance (50K only). Only for 50K runners. All the information is here.